A new measurement provides the most accurate weight yet of antimatter, revealing the mass of the antiproton (the proton’s antiparticle) down to one part in a billion, researchers announced Thursday. The result, detailed this week in the journal Nature, may help scientists investigate the mystery of why the universe is made of regular matter even though they suspect roughly equal parts of matter and antimatter were around just after the universe formed. When a particle, such as a proton, meets with its antimatter partner, the antiproton, the two annihilate each other in a powerful explosion. “At present, we are very far from understanding what happened to all the antimatter that was created in equal proportion to matter in the Big Bang,” physicist Mike Charlton of Swansea University in the United Kingdom wrote in an accompanying Nature article. 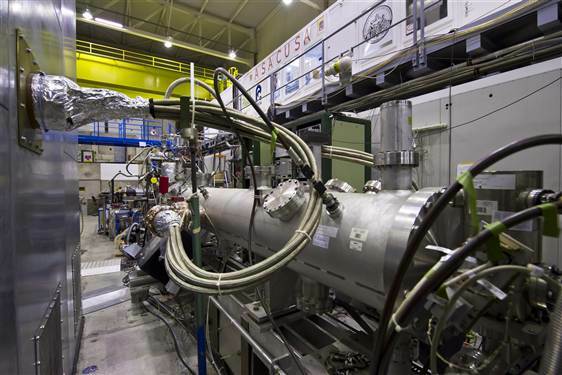 The experiment was carried out in the anti­proton decelerator at CERN, the European particle-physics laboratory near Geneva, as part of the lab’s Atomic Spectroscopy And Collisions Using Slow Antiprotons experiment, or ASACUSA. The machine sends pulses of antiprotons about every hundred seconds into cold helium gas. While most of the antiprotons quickly annihilate with regular matter, a tiny number survive by combining with helium to form hybrid atoms that contain matter and antimatter — antiprotonic helium. The antiproton takes the place of an electron in these hybrids, sitting in a spot that’s shielded from the helium nucleus (which is regular matter and which would cause the two to annihilate). Using laser beams to excite the atoms, scientists can then get the antiproton to jump to a new energy level, one that is no longer shielded from the nucleus and — bang! — annihilation. The wavelength of light used to force this jump can be placed into complex equations that reveal the mass of an antiproton to an unprecedented level of accuracy. However, a source of inaccuracy comes from the fact that the atoms jiggle around, so that those moving toward and away from the beam experience slightly different frequencies. A similar effect, called the Doppler shift, causes the siren of an approaching ambulance to apparently change pitch as it passes you. In their previous measurement in 2006, the same team used one laser beam, and the achievable accuracy was dominated by this jiggling effect. This time they used two beams moving in opposite directions, with the result that the jiggle for the two beams was partly canceled out. The result was a four-fold boost in accuracy. “This is a very satisfying result,” Masaki Hori, a project leader in the antiproton collaboration, said in a statement. “It means that our measurement of the antiproton’s mass relative to the electron is now almost as accurate as that of the proton.” These experiments may really head scientists in the right direction for figuring out the antimatter-matter conundrum, Charlton said. He added, “We actually don’t know where to look (for the answer). We have no theoretical guidance on this whatsoever.” Even so, the result of that difference, though likely to be tiny, “is profound,” he said.